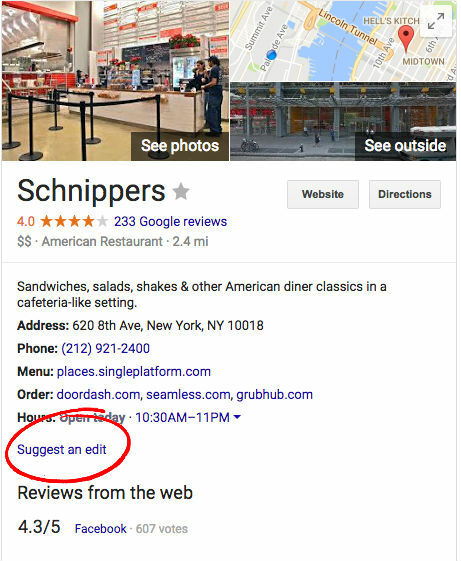 Did you know that any user on the web can make a change to the location and business information associated with your restaurant on Google? Do a Google search on your favorite restaurant and I will show you you. 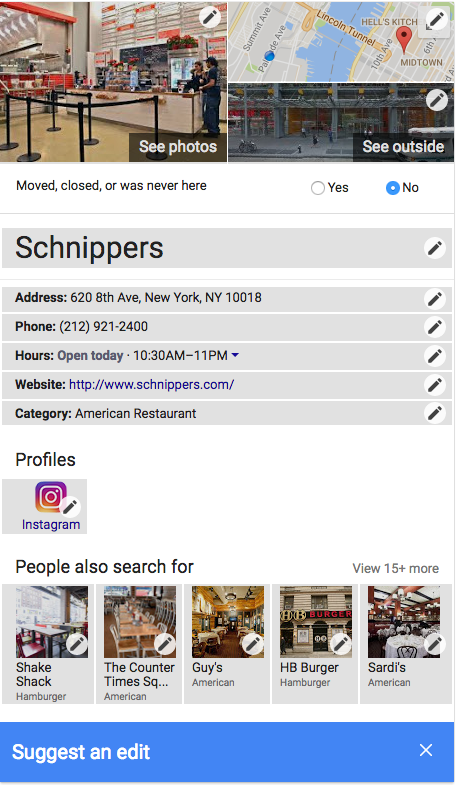 As an example, I’ll use a Burger spot here in NYC that I love; Schnippers. When I enter the word “schnippers” into a Google search, my results come back looking like this. If you look right at the bottom in the red circle. Do you see where it says “Suggest an edit”? You, and anyone else, can click that and have the ability to change the information associated with the business. Don’t believe me? My friend Sara owns a fantastic tapas restaurant in the East Village called Poco NYC. They’re very well known for their sharing plates, delicious brunch, interesting cocktails and their breakfast tacos (which you can get catered to your home or office!) 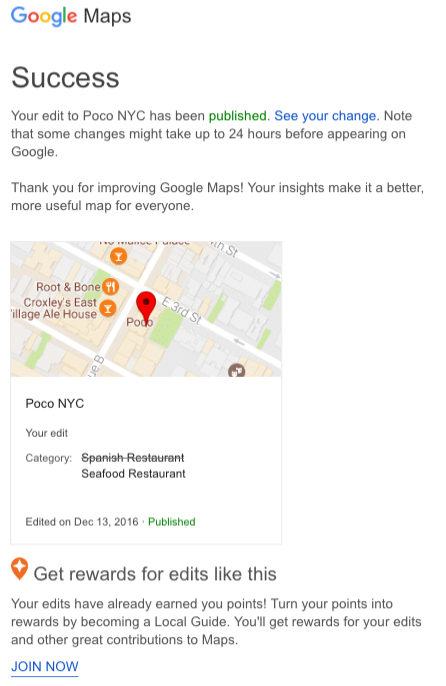 I was helping her fix her location data and in the click of a button, I turned Poco NYC into a seafood restaurant. Not long after I clicked the button, Google sent me a thank you email that encouraged me with reward points to make more changes to local businesses! As a business owner there are 2 actions you can take to protect yourself from people incorrectly, or worse, nefariously, changing your location data. – it’s free and relatively easy to do. Once you have control of your profile, you can quickly make edits and updates to your page. Here’s a quick video that will show you how to claim your Google My Business listing. 2. Use software like Yext PowerListings® to control all your location data. Yext will save you dozens, if not hundreds, of the man hours that it would take to update your location data on all their partner websites through a single dashboard. You can update Bing, Yahoo!, Facebook, Yelp, Foursquare and dozens of other listing sites, including Google, with their software. One of the best parts of using Yext to control your location data is that it locks it so that no one can make an alteration. You have the ultimate control of your data. It’s worth the $50 a month cost just for that feature alone. By the way, this is not a sponsored post and no one at Yext asked me to write it. But, I am a fan of what they do and I would advocate using their software. I also advocate for eating this Burger from Duke’s Original Roadhouse on the Upper East Side. 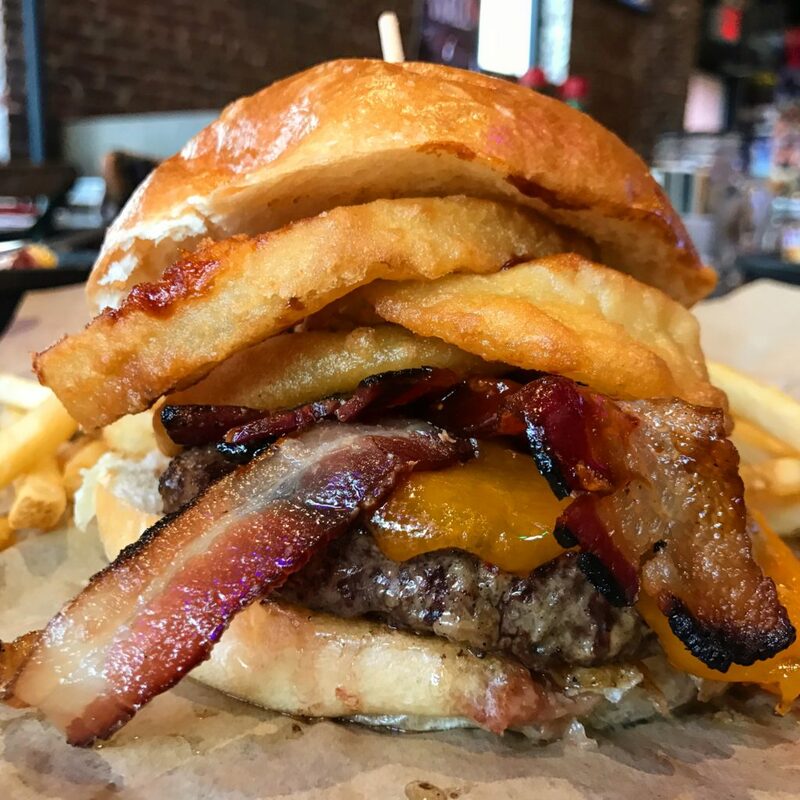 They call it the “Southern Comfort” and it comes topped with crispy bacon, onion rings, monterey jack & Duke’s roadhouse sauce. Claiming your Google My Business listing is vitally important to a brick and mortar business. Anyone on the web can make edits to your business listing and the only way to correct it is by manually changing the information or through using location data management software. Do you need help correcting and managing your location data accuracy? 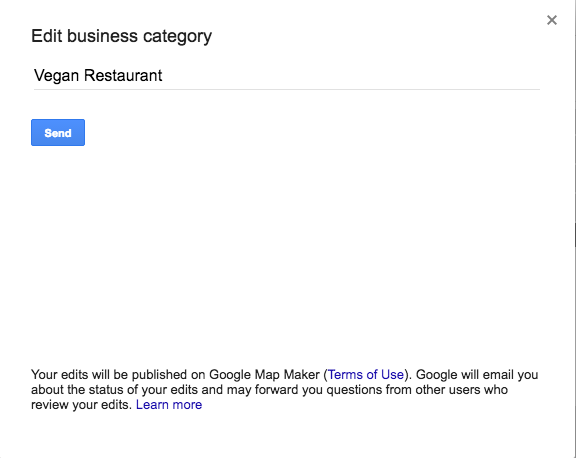 This entry was posted in Burgers, Google My Business, Location Data, Marketing and tagged google my business, help, location data, suggest an edit, Yext PowerListings. Bookmark the permalink.